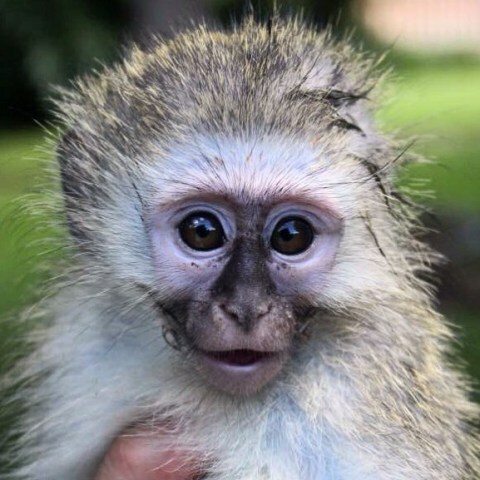 Part two of a really insightful blog post from, Jana, one of our past monkey project volunteers. This is really worth a read if you are heading out to join the programme. “The daily routine is mostly the same every day. You get up in the morning to be at the main house between 6:15 and 6:30. Trust me, taking a shower in the morning is of absolutely no use. Depending on your group, you give the babies their bottle, scrub the fences of one of the enclosures, clean clinic or quarantine or prepare the food for today. Breakfast is at 9:00 and after breakfast you clean up what is left or the food prep area, or go harvesting. In general people help each other and the other groups once they are done. Every once in a while, monkeys get introduced to a new group or a new enclosure. This results in having to sit by their enclosure to monitor their behavior. Don’t imagine it to be easy. It is a challenge to keep your assigned monkey under surveillance and not to lose it in the group. It does give you a great opportunity to watch their interaction and to get to know their behavior. During food delivery everyone gathers at the food prep site to sort whatever has been delivered. If you take it with humour, every task turns out to be fun. When everything is completed it’s time for the fun stuff: spending time with the monkeys. This is done by either going into the baby enclosure, the monkey enclosure or taking them to the pool. You always have someone experienced with you to help you out in case they get to rough. Be prepared for a nip here and there, but do not panic. It’s just how monkeys do. The greatest thing is, when you are chosen by a monkey (mine was Tarzan). It just happens and usually that special monkey is the first one to jump at you when they get out and to run to you when it thinks it needs protection or just wants to have some more cuddles. Try to blow in their mouth, they make the funniest face and it does make a funny sound. Life here was a good mixture of work and fun. I didn’t think the work was too hard or too straining as long as everyone helps each other out. It took a bit of time to get used to taking showers with monkeys watching from the trees and seeing big baboons (not being in an enclosure) running into the bushes when you got up in the mornings. You should check your bed every time before you get in. I always forgot. But we did have two scorpion and two spider encounters. So do be prepared, but it is not anything that happens on a daily basis. Mondays and Wednesdays are usually town days. You can either go to town or tell people to pick up some stuff for you. Note that you do ride on the back of the pickup truck. It is an experience but my boyfriend got a bit mad at me and you might want to decide for yourself if you show your parents a picture of you riding in the back of a pickup truck. The selections you find in the supermarkets are the general standard of the country you originate from. If you get the chance I would recommend taking the trip to Krüger National Park. It does not guarantee that you see the big five, but if you are lucky you will. Even if you have to explain your family back home that the big gray lump in your picture is actually a rhinoceros. They will believe you in the end.